A federal courthouse in lower Manhattan has removed a historical exhibit outside the courtroom where former governor’s aide Joseph Percoco will be tried in January on bribery charges after complaints that it was biased against defendants. The display of posters created for the 125th anniversary of the Second U.S. Circuit Court of Appeals featured famous cases heard by the court, including 30 criminal cases. None ended in acquittal. Attorneys for Percoco and three co-defendants complained in an Oct. 26 letter that the display of convicted and notorious criminals — from terrorists to mobsters to public officials — would prejudice the jury. Gov. Andrew Cuomo’s former lieutenant Joseph Percoco faces a federal corruption trial in January. 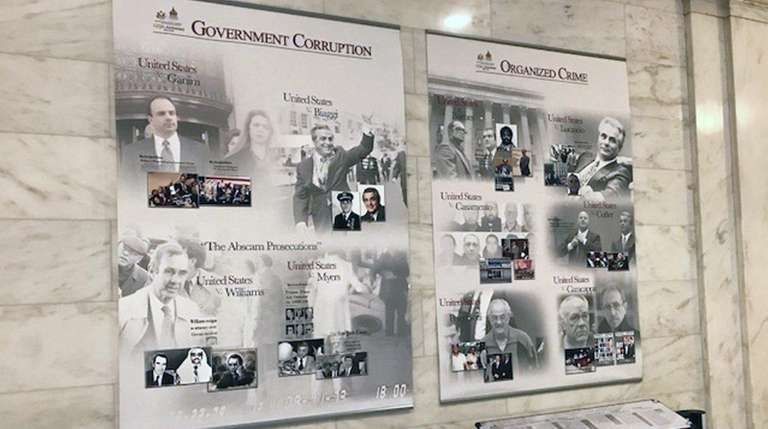 The posters have now been replaced with an exhibit highlighting the Second Circuit’s links to the U.S. Supreme Court, featuring pictures and biographies of justices with ties to New York such as Thurgood Marshall, Sonia Sotomayor and Ruth Bader Ginsburg. Percoco, a former top lieutenant to Gov. Andrew M. Cuomo, is charged, along with three others, with taking payoffs from an energy company and a developer to use clout in the executive chamber to benefit them. Their trial may take place in a courtroom adjacent to the exhibit. Daniel Gitner, the attorney for co-defendant Peter Galbraith Kelly who complained about the display on behalf of all four defendants, did not return a call for comment on the change. A spokeswoman for the Second Circuit also did not return a call for comment.